I once saw a bird carrying a worm in its mouth at approximately 4pm which cast a shadow over the well-known idiom. Philosophically speaking this means that there’s money to be made 24/7 on this squirmy 25 payline online slots game. 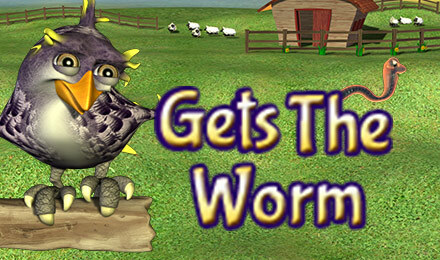 Slither your way through a wide-range of garden critters to win yourself some cash rewards. Join & spin today! Eyecon is always going that extra mile to ensure that they constantly deliver compatibility and reliability. They are a leading developer of many gambling type games that you will be familiar with such as scratch cards and slot games uk. They also work inventively behind the scenes with Casino operators praising them in their professional and rapid management service. Due to this, they are firm favourites within the casino world, and this is before their actual software is considered. In Gets the Worm, Eyecon delivers a fresh approach to farming. Forget growing crops, it’s time to grow your fortune in this immersive farm world! Although on the surface, the game’s appearance looks like it could do with a lick of paint, this is what gives the game its extra charm. It strips back the high-quality graphics and instead focuses on what’s important, the content itself. All the images that you can see before you will remind you of what you can expect at a farmyard: there are masses of green fields, accompanied with a warm, basking sun and grazing sheep, finished off with a characteristic red barn. This 5 reel, 25 pay-line slot awards up to a barney 112 free spins per game. 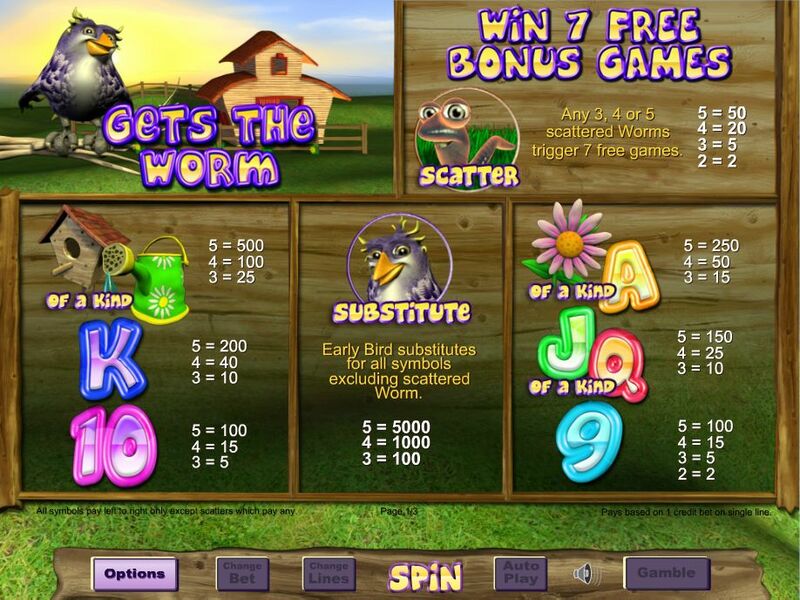 The worm represents the scatter card, 3 or more will reward you with free spins. This can be achieved through a bonus game which is triggered by the bird card, which substitutes for all symbols except the scattered worm. 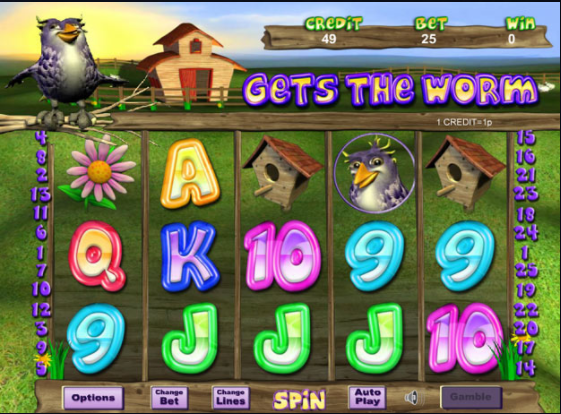 However, what is striking about this game, compared to other casino slot-games, is that during the free spins, the bird can substitute for the scattered worm meaning that there is another egg-cellent opportunity to receive more free spins. The game allows you to do this up to 15 times, meaning the max you can expect to get in one game is 112 spins. With the bet starting at just 1p advancing up to £25, the chances of you getting those free spins are even more in your favor knowing you don’t have to break the bank to get there. Another bonus feature of this game is the gamble button which offers the opportunity for you to double your earnings or lose it all and this can be repeated up to 5 times. This feature adds excitement to the game and an ace feature for those thrill seekers out there. The wildcard symbol is the games logo graphic, and if you can match 5 consecutively across an active pay-line, it will result in the 20,000-credit jackpot! Evidently, this game has a lot more to offer than what was on the surface, which is why it deserves your attention today! You can find more Easy slot games here. The early bird may catch the worm but the beauty of this game is that you can spin the slots any time of day and still catch that worm as well as the barn-iest cash prizes! And from 1p per spin, it can’t be overlooked without given a chance first! Once you've finished with the worms. Read more about how to deposit by mobile slots and claim your free spins today!